The Acura TLX is a new sports sedan for 2015 that gives you the choice of 4 or 6 cylinder power, and even the option of Super Handling All-Wheel Drive. Visit Acura of Moncton, N.B. and take this just right sized sedan for a test drive. We're in the heart of the Maritimes, and easy to get to from Dieppe and Riverview, N.B. INFINITI's 2015 Q50 is also a midsize sports sedan, but it's premium price, and lack of choices just makes it seem less compelling when compared to the Acura. The base price of the INFINITI is more than $2,500 greater than the price of the Acura. For that lower price, in the TLX you also get heated front seats, a sunroof, and a 60/40 split folding rear seat. Those features are only available on the INFINITI Q50 AWD, which has a starting price almost $2,500 more. Acura give you a choice in the TLX of an efficient 2.4 liter 4 cylinder, or a more powerful 3.5-liter V6, one with an 8-speed automatic and the other with a 9-speed. The INFINITI Q50 is powered by a 3.7-liter V6 and a 7-speed automatic. Both TXL options get better fuel economy than the Q50, with the 2.4-liter I4 rated at 9.6L/100km city 6.6 highway and the V6 at 11.2 city 6.9 highway. The Q50 is rated at 12L/100km city and 8.1 highway. Both cars offer 2 and all-wheel drive versions, but the base INFINITI is rear wheel drive, and the Acura is front wheel drive for better traction in bad weather. Both of these sports sedans have optional all-wheel drive systems, but only the TLX features Super Handling All-Wheel Drive. This computer controlled system not only give you more traction when the weather is bad, it gives you sportier cornering when the weather is nice. On dry pavement the system powers the outside rear wheel more than the inside to help rotate the rear, and make the car corner better. The Q50 has no such feature. 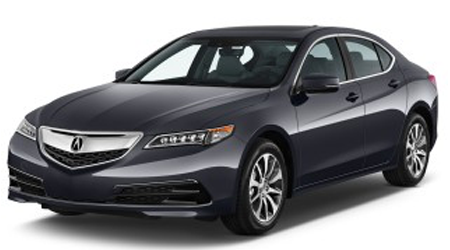 The 2015 Acura TLX is sporty, luxurious, and hard to beat whether the road is wet or dry. In Moncton, Acura of Moncton has deals that are heard to beat, and a location easy to get to from all of New Brunswick.